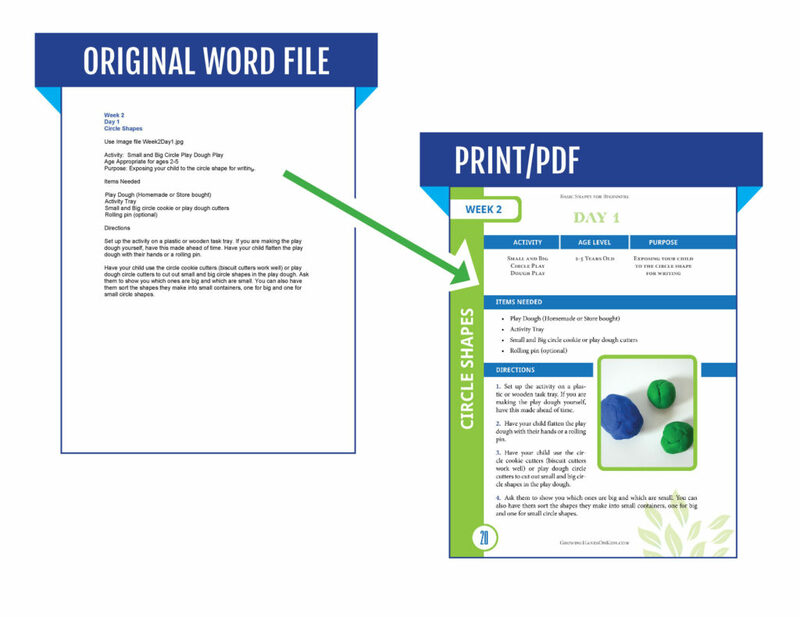 As a former Microsoft Office instructor and now as a full-service book designer, I have compiled this style guide to help make your author experience easier and more professional. Some of the items listed here fall under “Learning How to Make Microsoft Word Work For You”. Microsoft Word is extremely powerful, and very few people know how to bring it under their control. All of your book content should be in one document and in the correct order. We can move things around if we need to, but that is not ideal. Even if you don’t have the finished content for that chapter (not ideal), you should still have a chapter heading as a placeholder. Since I will be stripping out the majority of any formatting you have done, my suggestion is that you keep everything as simple as possible. You focus on the content; I will focus on the formatting. I will take care of the headers/footers, table of contents, page numbers, and linking back to other sections within the book if necessary. Do not use multiple returns to accomplish anything. Do not use text frames. Ever, lol. Do not underline anything unless it is a hyperlink. Even then, you don’t have to underline it manually. My software will pick up all links. Page breaks should be achieved by modifying your paragraph styles to use the “page break before” option. If you’re not familiar with that, then hit “ctrl+enter” to achieve a manual page break. To establish a scene break, simply type in “Scene Break” onto its own line. Do not just hit the enter key two or three times. You can also type in “***” or something similar. Do not just hit the return key once for every line you think there should be. Instead, type in “Insert 1 line” or “Insert 2 lines”, etc. If all questions will use the same number of lines, then no notation is needed. The original text is left in place and is also made into its own call out quote somewhere around the surrounding text. The original text is extracted AS the call out quote. So make sure you know which option you want to use. The same format should be followed throughout the book (to stay in the text + a call out quote or as a call-out quote only). My mother wise a very wise woman. She was always dropping words of wisdom in my lap. Too bad they never made it up to my ears. One that I repeat back to my kids is, “Fool me once, shame on you. Fool me twice, shame on me.” And they don’t listen either. COQ: Fool me once, shame on you. Fool me twice, shame on me. There should be an order to the text flow. If you have 8 chapters and 6 of them have a quote under the chapter heading, then go back in and add quotes to the other 2 as well. If you are writing an activities book, then you should have your text in a repeating pattern for each activity. Even if one of the fields will be blank, the activity text should conform to some type of order. Give you a word count goal you should hit for each devo. See this example pulled from Heather Greutman’s project, “Basic Shapes for Beginners”. Heather’s website is Growing Hands-on Kids. This is a pretty lengthy section, but it’s important, so stick with me. If you’re a visual learner, then you should still read this, BUT also go to youtube and search on “Microsoft Word paragraph styles”. Put in your version of Word into the search for results specific to your setup (i.e. “Microsoft Word 2010 paragraph styles”. But it should be the same or pretty close to the same through each version. Paragraph styles are oft-misunderstood. Several people only see them as a decorative option, not as the organizational utility that they are. Some of you may be bloggers and may already be familiar with terms like “heading 1”, “heading 2”, etc. These should be used to structure the outline of your document. Since all text in a Word document is reduced to HTML (code), we have to think of it in those simple terms. “Heading 1” is reserved for the top-most level of your book. For some you, that will mean “Part 1”, “Part 2”, “Part 3”, etc. Then your chapter titles will be marked as “heading 2”. If your book does not have parts or sections and instead goes straight into chapters, then your chapters will be marked “heading 1”. Subheadings within chapters should be marked with the next logical heading style. If you don’t see a “heading 3” or “heading 4” style in your style list, you can easily create one and then start using it. You shouldn’t have a Heading 1 then skip straight to a Heading 3. They should go in order. You can’t have a 3 without a 2. Let’s use a cookbook as an example. Our cookbook has Introduction, Recipes, and About the Author as its main sections. Those are all “heading 1”. Inside the Recipes section are three sub-sections: “Breakfast”, “Lunch”, and “Dessert”. Those are all “heading 2”. 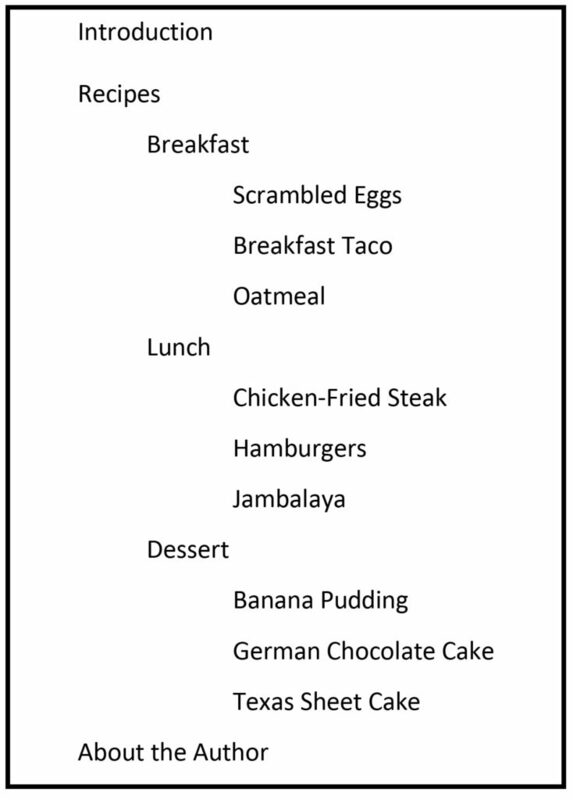 Inside the “Breakfast” sub-section are three recipes: “Scrambled Eggs”, “Breakfast Taco”, and “Oatmeal”. Those are all “heading 3”, falling under the “Breakfast” (heading 2). Inside the “Lunch” sub-section are three recipes: “Chicken-Fried Steak”, “Hamburgers”, and “Jambalaya”. Those are all “heading 3”, falling under the “Lunch” (heading 2). Inside the “Dessert” sub-section are three recipes: “Banana Pudding”, “German Chocolate Cake”, and “Texas Sheet Cake”. Those are all “heading 3”, falling under the “Breakfast” (heading 2). Do not use more than one font. It serves no purpose other than to take up your time. You and I will discuss font selections for the interior. Heading fonts are usually pulled from the cover so that we can maintain cohesion from cover-to-cover. All images should be in the highest quality obtainable and uncropped/unedited. I will handle the cropping and the sizing of the image for final export. The image should be able to obtain 300 dpi on final export. The best way to go about having images in a book is for you to not insert them at all. Instead, you should properly label your files and place them in the Dropbox in the “From Client” folder. If you’re not skilled with Dropbox, we will use email or Google Drive if necessary. In your manuscript, type out which image you want inserted at the place it needs to go in or by and if you want a caption to go with the photo, type that out as well. Notice in my example that I am using key words like “insert image” and “caption”, so that the document can easily be searched for these indicators. Caption: Here I am receiving the prestigious “Your Book is Outstanding!” award in 2015. Footnotes should be inserted by positioning your cursor after the word/sentence that you want to footnote then hit alt+ctrl+F or go to “references–insert footnote”. I will control the final formatting and placement of the footnotes. You just get them in there where they need to go and make sure they are properly cited.